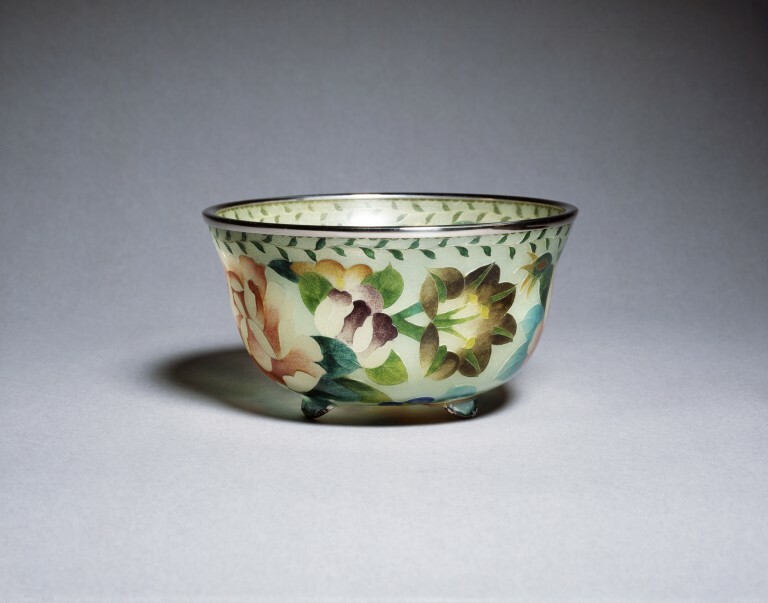 Cloisonné enamel bowl with flowers in <i>shotai-jippo </i>(a technique whereby the metal body of the vessel is dissolved after enamelling), with an applied chrome-plated rim and foot-edges. This elegant shotai-jippo bowl has an applied chrome-plated rim and foot-edges. It is decorated with a silver yusen design of peony, convolvulus, rose, gentian and chrysanthemum in polychrome shaded enamels on a pale translucent green enamel ground. Under the rim is a delicate trailing pattern of green leaves in silver yusen enamels. The bowl has a relatively light body to which three small feet have been attached. Similar pieces were still being produced in Nagoya and sold through the Inaba Company of Kyoto until the late 1990s. See Nihon no Bijutsu p.95, ill. 13 for an almost identical bowl by Kato Hideo. 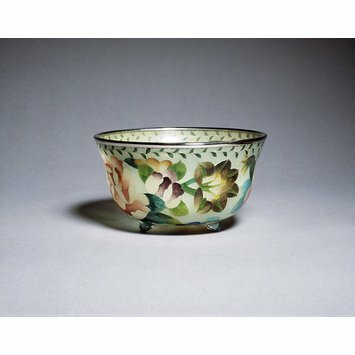 Cloisonné enamel bowl with flowers in shotai-jippo (a technique whereby the metal body of the vessel is dissolved after enamelling), with an applied chrome-plated rim and foot-edges. Cloisonné enamel bowl decorated with flowers, Nagoya, Japan, c.1912-26. Irvine, Gregory. Japanese Cloisonné Enamels. (London: V&A Publishing, 2011). pl.49.